The proposed laboratory research will utilise the 16 m-long, 6 m-wide, and 2 m-deep hydraulic flume available in The Deep at the University of Hull. The flume is fully controllable (flow rates, depth, weir height, water surface slope) via a control interface, which permits the running of set, pre-determined hydrographs. 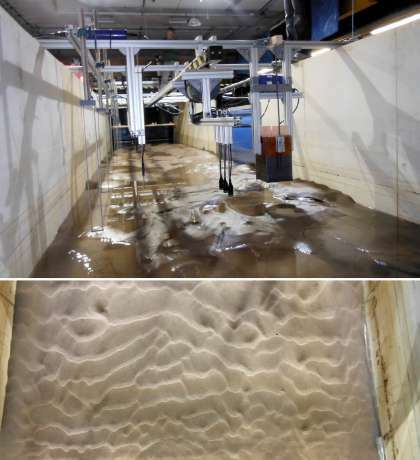 The flume is also fitted with a robotically controlled carriage that permits deployment of a range of acoustic and laser based measurement equipment in predetermined configurations over a designated test length. The mobile bed experiments (MBX) will have two main tasks: initially MBX will derive equilibrium bed morphologies through running constant steady flow conditions that will provide the scaling for construction of the models used in the FBX. A series of MBX will then be run with different hydrographs, to examine flow-bed interactions across a range of transient conditions. Fixed bed experiments, determined by MBX will then be used to examine the detailed turbulent flow fields over fixed bedforms at a range of disequilibrium states. The flow velocity and flow depth will be moved from the equilibrium conditions that derived the bed in MBX to examine details of the flow structures under transient conditions.